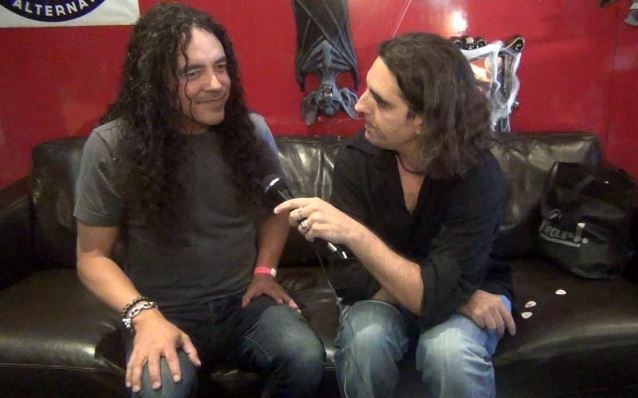 Argentinean rock journalist Lucas H. Gordon recently conducted an interview with former OZZY OSBOURNE and current ALICE IN CHAINS bassist Mike Inez. You can now watch the chat below. A couple of excerpts follow (transcribed by BLABBERMOUTH.NET). Inez: "Drug addiction is beyond music business. Whether you're a washer-dryer repairman or a mechanic… alcoholism and drug addiction seems to go through all walks of life. It's a pretty crazy business we're in already. It's such a shame when your friends pass away so young. I mean, we're supposed to all grow old together. It's just sad." Inez: "We just did, I think, about a 28-, 29-country tour, and we just ended in Canada now, so we're off until the springtime. So we're taking a break now. I get to come and hang out with my beautiful wife and just stay home in L.A., visit my grandmother. It's nice to be home. It's kind of weird, though. You're living in hotels and touring all over the world, and you come home, and then it's funny. I don't have a lobby call the next day. It takes a while to get used to this again. But it's nice to be home, that's for sure." Inez: "If Ozzy needed anything, not just musically, but if he ever needed me for anything, I would be the the first one there. Ozzy is like one of my fathers; he gave me my start in this business. Before I joined the Ozzy band, I played at this club here with my old band, and there was 12 people there on a Wednesday night. So I had to leave; that was my last show with that band. That Sunday after that last gig, I was living in a castle in Ireland with Ozzy; we were rehearsing to play Wembley. So Ozzy took me out of that into this amazing lifestyle and taught me so much. I always say I went to the school of Ozzy Osbourme, I went to the Ozzy university. He taught me a lot about this business and about how to play big stages and how to get a good bass tone. I mean, Ozzy is so smart. He's smarter than people think; he's a very wise man… We have such a good relationship. It goes beyond just the business and making music. We're like family. I would do anything for Ozzy. He knows that too. I'm so in debt to him; I just love the man… He made me laugh, I think, more than any one person. Between him and Zakk Wylde, all I did was laugh the whole tour." Inez: "I don't really look at it that way. The difference between the L.A. scene —I was born and raised here, you know — and the Seattle scene is, those bands up in Seattle…. Like, SOUNDGARDEN was a band for ten years before they got signed to a major label. So they had a lot of time to get together and gel as a band. Even all the bands like NIRVANA and ALICE IN CHAINS in their early days and PEARL JAM, MOTHER LOVE BONE, they had a lot of time to jam together before they released their music to the world. So I think that was very important. Where here in Los Angeles, they were just trying to mix and match bands by… 'Oh, we need a bass player with long, blonde hair,' or 'We need a singer with curly hair.' They were just trying to do that. So the music started lacking, I think, because of it. But I'll tell you one thing about the L.A. scene: there was more girls in the '80s here than I've ever seen anywhere in my life. [laughs] It was a really fun time to see that. I was very young at the time, but it was nice to see that. Just in high school, to see bands like VAN HALEN play a backyard party, or MÖTLEY CRÜE play the Whisky or… It was really cool to see these bands. Me and Slash are the two only rock stars, we're the only two guys born and raised here. It's funny. Everybody else comes here, but we've been here the whole time. We've seen it come and go."